Corrective jaw surgery, or orthognathic surgery, involves surgically repositioning jaws that are misaligned and placing them in their proper position. These procedures are usually performed in conjunction with orthodontics. The thought of this type of procedure can be confusing and sometimes frightening concepts for many patients and their families. The following information is designed to give patients a better understanding of the indications and results for these types of procedures. Dr. Maranon hopes that this will give patients a fuller understanding of the entire orthodontic and surgical experience. It is his goal for patients to feel completely informed and comfortable with their treatment and procedures. For more information about Corrective Jaw Surgery or to schedule a consultation with Dr. Maranon, call our office in Encino, CA at Encino CA Oral Surgery Office Phone Number 818-990-5500. You may also use our Appointment Request form. The level of sophistication in dentistry, orthodontics, and oral and maxillofacial surgery has increased dramatically in the past decade. Orthodontics can usually correct the way your teeth fit together or “occlusion”. People with an improper bite because the jaws are positioned incorrectly or misaligned may benefit from orthodontics and corrective jaw surgery. Jaw alignment problems can result in a host of problems that affect chewing function, speech, long-term oral health and appearance. These alignment problems may also lead to damage of teeth and the jaw. Orthodontics alone can correct bite problems when only the teeth are involved. Surgery is considered for skeletal malocclusion when orthodontics alone would compromise the facial appearance or not correct the functional problem. A patient’s first option is always no treatment. It must be understood that there can be functional changes and quality of life issues associated with no treatment. Some of these changes or problems may not become apparent for many years. A second option is camouflage orthodontic treatment. This type of treatment can often make your teeth look better, but does not address the underlying jaw relationships that contribute to this type of malocclusion. The third option is a combined orthodontic and surgical approach. This manner of treatment addresses not only the dental issues but also how the skeletal issues coordinate with the jaws and face. Corrective surgery is performed to correct a wide range of minor and major skeletal and dental irregularities. This, in turn, can improve chewing, speaking, breathing and facial aesthetics. Surgery is an option for moderate-to-severe jaw problems that cannot be resolved with orthodontics alone. Each patient’s jaw surgery is performed to correct the functional problems related to jaw alignment and is planned with full consideration of their facial balance and aesthetics. Appearance may be dramatically enhanced as a result of surgery. Correcting jaws that don’t align properly is the most common reason for this surgery. Correcting facial imbalance improves the appearance of patients who have deficient or prominent chins, protruding underbites and overbites, or cleft palate. The surgery can improve “gummy” smiles, where lips pull upward, showing large areas of the gums, and “toothless” smiles, where the lips cover all the teeth. You may also reduce the risk of temporomandibular joint disease (TMJ) and other jaw diseases. 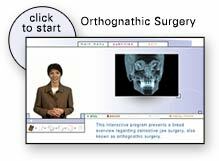 Orthognathic surgery also enlarges the airway which can be a help in cases of sleep apnea. To find out if you are a candidate for corrective jaw surgery, use our online form or call our Encino office to schedule a consult: Encino CA Oral Surgery Office Phone Number 818-990-5500.